The Greater Chicago Food Depository (GCFD) issued the results of a study on hunger in Chicago. Four areas of the city were found to have especially high rates of hunger, and the GCFD has instituted a new mobile food pantry program to target those areas most in need. The Mission of Our Lady of the Angels serves one such area and hosts the mobile food pantry. Volunteers are needed from 8:45 until 11AM (and can arrive late if necessary) to help dispense food from the mobile food pantry and greet members of the community. 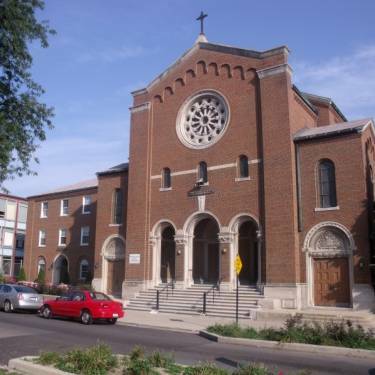 Our Lady of the Angels, run by ND alum Father Bob Lombardo, ’79, is located on Chicago’s West Side at 3808 West Iowa, near Pulaski and Chicago. Please visit the website (http://www.missionola.com/). Where? 824 N. Hamlin, Chicago, 60651 (Kelly Hall). Parking? Please park on the street on Hamlin or on Iowa (in front of the church). When? Every first Saturday of the month unless there is a holiday. Holiday date changes will be announced on the home page, the calendar page, and through the e-mail list. Time? Arrive between 8:30 and 9:00 am. The pantry concludes around 11 am. Do we need to sign up? There is no need to sign up unless you are bringing a group of more than 20 people. Please call 773-486-8431 if you are bringing a group of more than 20 people. Other? Please dress for the weather. The pantry is outside all year.